On this very day two years ago — on February 8, 2008 — a fine strapping lad was loosed upon the world, and immediately started yawping. Yes, its name was Art Scatter, and it was born right here in river city: in Puddletown, Oregon, brave bubble of liberality, Do It Yourself center of the universe, fearless exposer of itself to art, curious keeper of the weird. Call us sentimental, but we’ve been thinking a lot about our friend Art, this thing we call a blog. For one thing, why is it still here? A lot of blogs burn bright for a while and then flame out. Many are simply places to vent steam, or casual public diaries, or vanity projects. Well, almost all, including this one, are the latter at least to a certain degree. After all, nobody’s making any money out of this thing. Art Scatter has changed a lot over its two years. It was the brainchild of Barry Johnson, my friend and longtime arts section compatriot at The Oregonian, who was looking for a way to explore new approaches to journalism outside of the print world. Barry brought me and his friend Vernon Peterson, a lawyer and talented literary critic, into the project, which was planned to be not too taxing on anyone because there would be three people to fill the virtual space. Life moved on, and both Barry and Vernon departed for other projects. That left me wondering what to do with the thing, and wondering, sometimes, whether I was letting it eat up far too much of my time. In a very real sense my wife, Laura Grimes, saved the blog when she began to post her own witty and moving observations, eventually under the nom de plume of Mrs. Scatter. How could I not keep Art Scatter going? I was fascinated by how Mrs. Scatter’s adventures were going to turn out. Besides, she injected a bracing shot of humor into the blog, the humor that I have known and loved for more than twenty years. Martha Ullman West, the noted dance critic who had written a couple of pieces for us, began to contribute more, and that added to the conversation. But I realized that if the thing was going to keep going, it was going to be largely up to me. So. Why was I doing this? First, writing’s a habit. I do it reflexively, if not always reflectively. Just can’t seem to help myself. Third, it allows me scope to write about a lot of things in a lot of ways that were rarely possible during my years in daily journalism. Fourth, it keeps me connected to my community and allows me to have a voice in a few things that go on in this little corner of the world. Good lord, I’ve made friends through this thing! Fifth, it helps me discover my post-newspaper writing voice. I can feel that voice waking up inside me, gradually realizing that it’s no longer bound by the newspaper straitjacket unless it chooses to be. I can hear it trying out new things, even whooping it up now and again. Good for you, voice. Let ‘er rip. Slowly, mostly accidentally, the blog has developed its own personality. The characters of Mr. and Mrs. Scatter just sort of announced themselves. The Large Smelly Boys pushed their way into the mix. OED, the Older Educated Daughter, made brief visits. We talked about word games and secret societies and oysters on the half-shell. The League of Tough-Guy Arts Observers had its brief day in the sunshine and then wandered off to sleep in a cave: perhaps it’ll wake up and elbow back into the action again. We found we were able to be serious, and flip, and amused, and reflective, and serious and amused again, and somehow get away with it. We began to take a very broad view of just what the word “culture” means. I’m sure Art Scatter will continue to evolve. It’s already changed in surprising and often delightful ways. It’s opened doors. I know people will drop in and out. Mrs. Scatter’s day job has been busy lately, and I’ve been missing her brilliant reports. (I’m sure you have, too.) Can’t wait for them to return. And I’ve become convinced of one thing: The blog has to work with my writing career, not against it. I love the freedom and scope that Art Scatter gives me, and I love that it lets me try things out with a regular and forgiving readership. But I also need to make a living, and I do that by writing. This is not a hobby. It’s what I do. So if Art Scatter is my professional exploratory laboratory (and also the locus of a great deal of my pro bono work) I want it to look professional. Which brings us to Modern, the new design theme that we’ve adopted, yes, today. And which wraps up this semi-impromptu State of the Blog address. Thank you, my fellow Scatterers. Good night, and God bless. Not Mr. Scatter delivering his State of the Blog address. 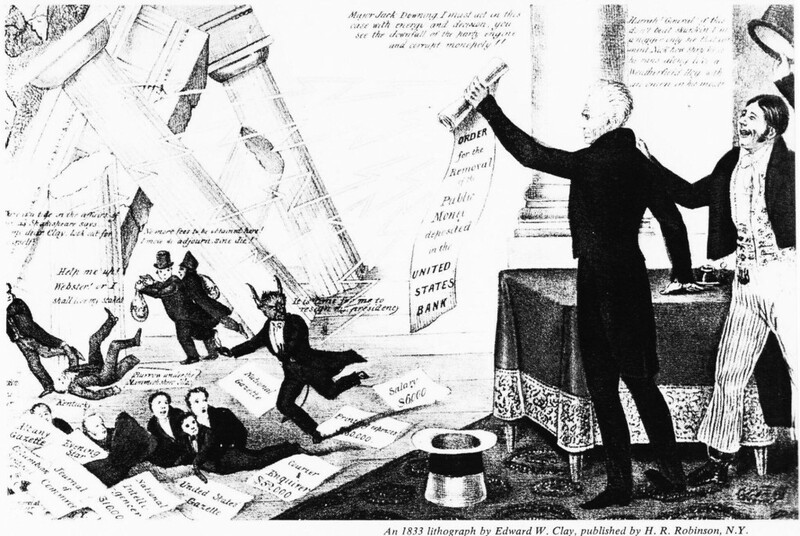 Edward W. Clay’s lithograph celebrates President Andrew Jackson’s destruction of the Second Bank of the United States with his “Removal Notice” (removal of federal deposits). Well done, Andy! Wikimedia Commons. Not Baby Art Scatter. 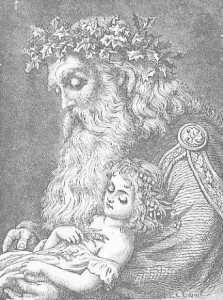 Father Time and Baby New Year from Frolic & Fun, 1897. Wikimedia Commons.